Online tracking information on the delivery status of registered mail/parcels sent overseas is available for selected destinations. For destinations listed below, online tracking information is available. Otherwise, tracking information is available up to departure from Hong Kong. Note : most of the tracking websites serve EMS (Speedpost service) only. As usual, I woke up and checked with my Etsy convo and order and so. I was so surprised and excited when I read convo from my customer Naomi from United Kindom!! She told me she wrote a blog on the little snowmen she bought from my store! She is awesome!! The little snowmen are for her coming Christmas with her boyfriend. She would love to build up a mix of meaningful decorations. It's very lovely of her to have a idea of decorating the flat in their own characters. I am sooooo blessed that the little snowmen will be in the collection of meaning decorations!! Although Christmas has not come yet, I can feel the warmth and love in the flat there in UK!! I personally love this set of snowmen so much. I needle felted them with my single pair of hands. They were given their own lives and own characters. Three of them are all loveliest ones, I can say!! I opened shops in Etsy with the belief that my love inside my every little cute thing would be passed to my customers. Nothing more wonderful than to spread love. And this time, Naomi really touched me with her article! Love spreads~~!! Wishing you a Merry Christmas, Naomi! & last but not least, visit her lovely blog eesome~~!!! Nothing lovelier than making custom stamp for wedding!! Recently I worked on 2 projects. Let's talk about Julie's one first. 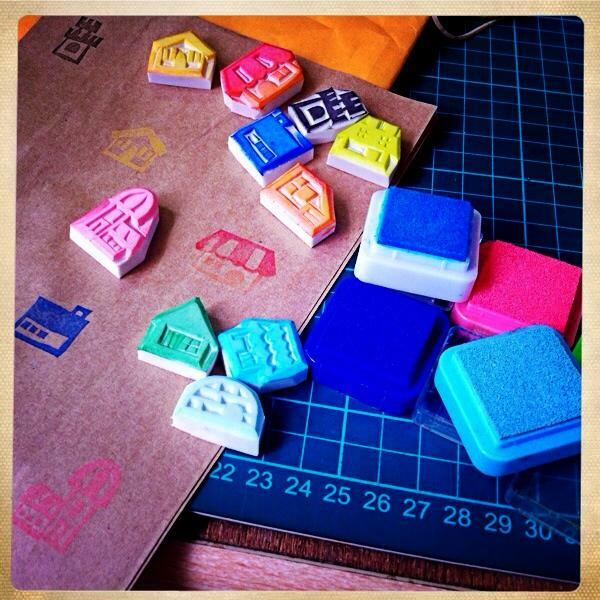 I have been making stamps for Julie for many times. All for her wedding. Her first order was just some standard wedding stamps in my shop. 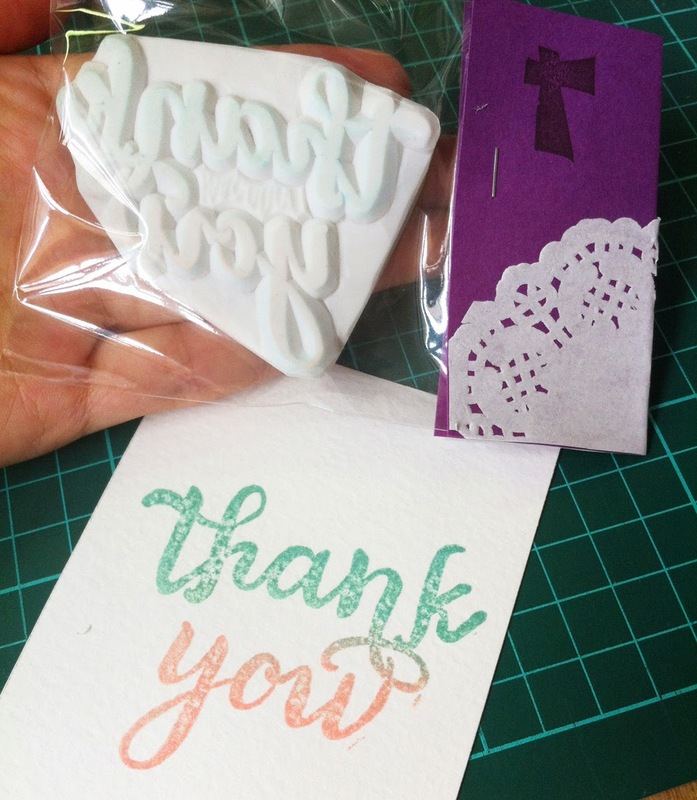 Then, I received her Etsy convo that she would like a stamp that says "Thank You" to fit on a 3x4 notecard. 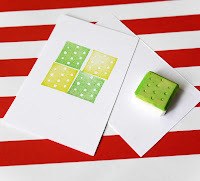 I have tried to stamp on a 3X4 notecard. It looks soooooo great and lovely! 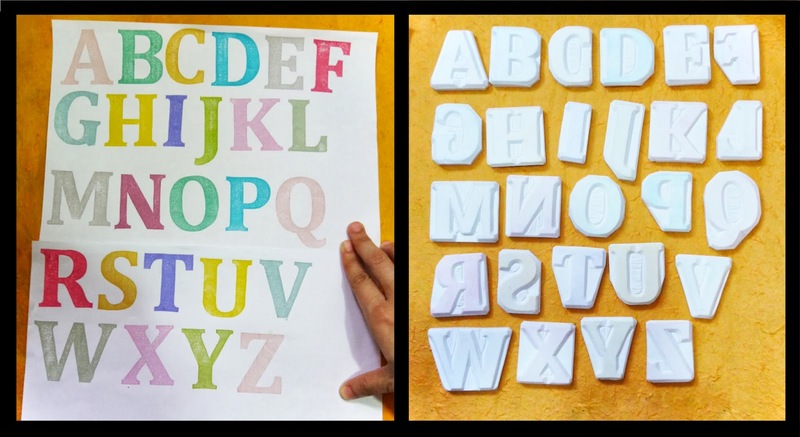 After not long, she send me message that she would like to do a crazy stamping project making all capitalized 2 inch letters. They are for a surprise to her husband. She could stamp a line of our song on an old piece of barn wood that she just found. How lucky his husband is to receive a lovely piece of work from her!! She is wonderful!! Thank you, Julie! Love you! I have been asked about what inks I am using. These are the loveliest set of ink pads I have!! My ink pads are from VersaCraft from Japan. You could have a look at them in this link: www.tsukineko.co.jp/product_craft/versacraft/index.html. 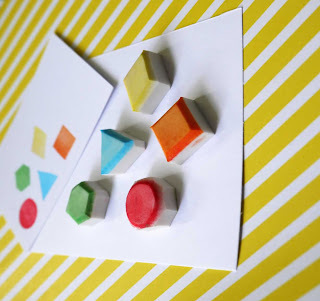 I especially love this sets of stamp which can be fit into fingers. 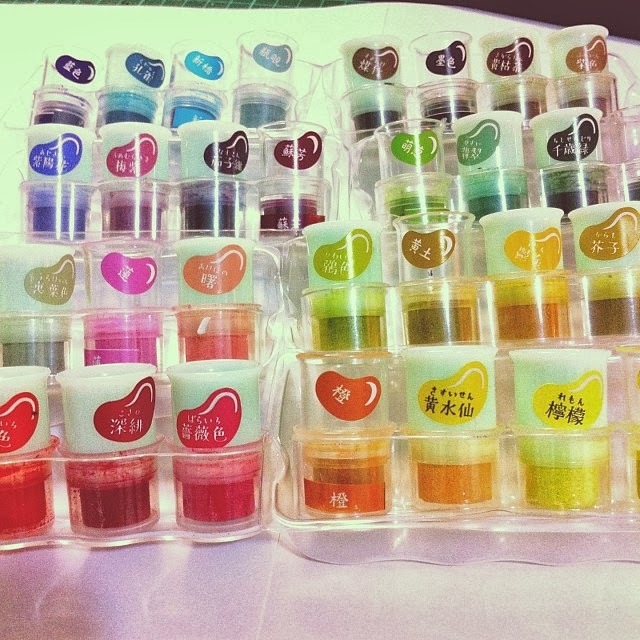 Blending of different colors can be made very easily. Moreover, they could be used on fabrics. I could stamp on cotton bags as packing of my items!! theKeris & SoftTear are on Facebook, Twitter and Instagram~!! DO come and find me, like me, follow me~!!! I need all your support soooooooo much! 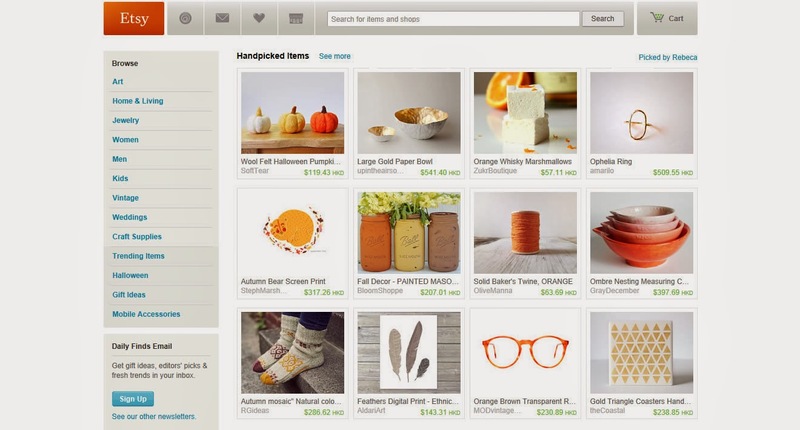 Woo~ SoftTear on the Front Page of Etsy!! Have been away from my Blogger for long. A great and wonderful news caused me to come back here to share~~ my shop SoftTear was on the front page of Etsy!! It's so amazing!! Oh, I couldn't believe it!! I know many of the Etsy shopkeepers have this experience. Maybe there have already been many times that it is just a piece of cake for them. But for me, I feel sooooooo wonderful!! Thanks to Rebeca!! My shop SoftTear has been opened for nearly 2 years. Every bit in building this shop is uneasy for me. It's my first shop. (Then, I opened theKeris.) I needle felted every billy ball flowers with only my own pair of hands. I, who is a layman in phototaking, took those pictures you are seeing in my shop. I added more items bit by bit. um... I can tell you... I love ALL my works in SoftTear sooooo much!! Custom Stamp for Jack's one year old Birthday! Nicole is a super kind customer. The conversation with her is a very nice and warm one. She is a lovely mum of Jack who has already started preaparing Jack's birthday while there are still months to go. I tried to make a birthday card using the custom stamp and some of my stamps. Wishing Jack a happy one year old birthday! A great news here! 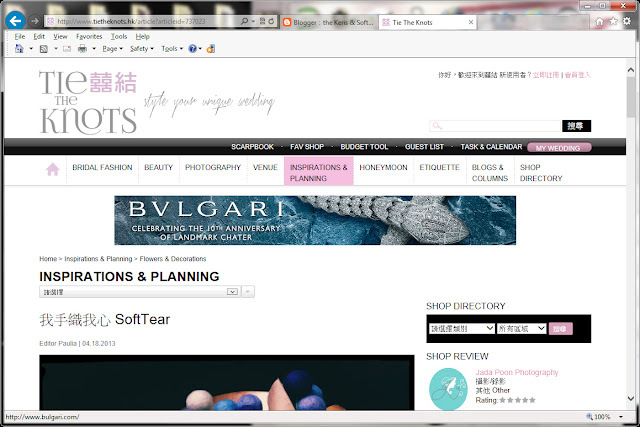 My shop SoftTear is featured in TIE-THE-KNOTS!! TIE-THE-KNOTS is an excellent site in which very uique and up-to-date wedding ideas could be found. It's just amazing! I was truly taken by surprise at that invitation. I was truly pleased. I feel very excited about it too! 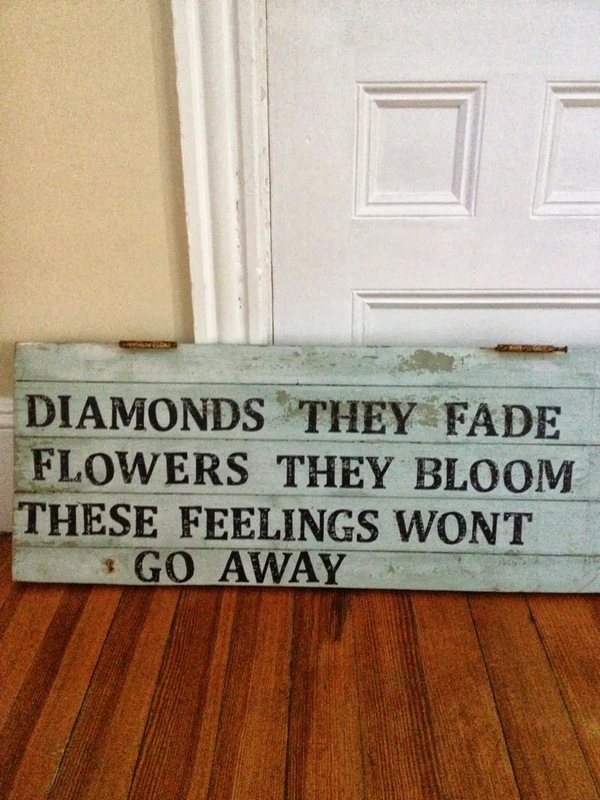 Not only could brides-to-be have ideas on their weddings, but also have inspirations on decorations for their new homes! I would like to express my sincere thanks here for this valuable chance for an article! Thanks, Paulia, the great Chief Editor!! A little about TIE-THE-KNOTS: Started in 2010, TIETHEKNOTS.HK was originated from Tie-The-Knots.com and blogs started by two young fashion & art loving women, who did not satisfy with the limited wedding planning resources & style found amongst existing online wedding websites in Hong Kong and inspired to create an one-stop interactive online wedding portal for unique wedding inspirations, which differentiate us from other wedding information website and magazines in Hong Kong. We have expanded to a team of dedicated wedding experts and target the ever-increasing population of sophisticated females in the middle to high class in Hong Kong and Greater China who do not limit themselves in luxury brands, but rather, look for uniqueness. Therefore, we would love to publish most update product news and promotion, as well as wedding ideas through photo sharing via our DIY tools "Scrapbook" to social community such as Facebook. I have visited the Snoopy World in Shatin in Hong Kong last weekend. It is quite a small-scaled theme park in terms of size and area. But, as a fans of Snoopy, Woodstock and Charlie Brown, you shall have a visit ot this unique theme park when you travel to Hong Kong. It is a great place to take special photos with the large characters. It is a very great place for kids in which there are playground for kids. It is also a good place to take a relaxing break from shopping nearby too. The entrance of Snoopy World! The BIG House of Snoopy! All the characters of Snoopy!! Fans of Snoopy would be crazy!! There is the School Bus in the Park too! 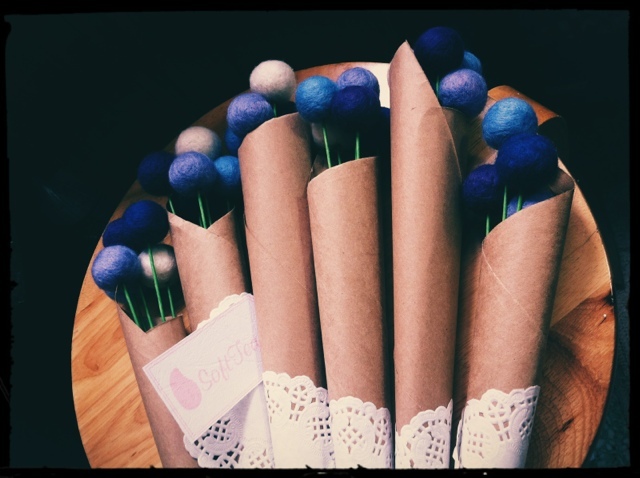 I couldn't forget the happiness of making Pom Pom Ball using tissue paper during the preparation of my friend's Wedding Party, I did one purple one to decoration my home!! It looks like a rose somehow! It made my dinning room more lovely and elegant! Another custom order for wedding! It's Whitney's wedding! 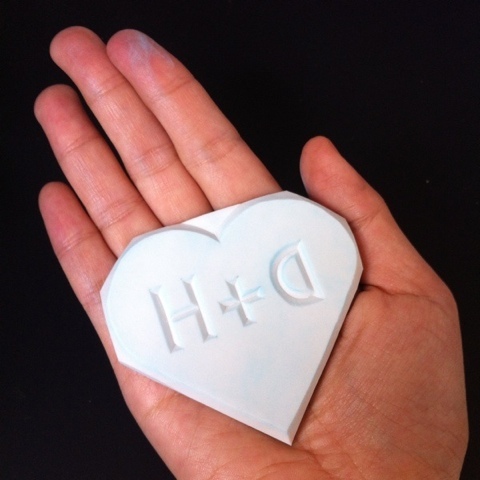 A giant heart size hand carved stamp with their initials for the wedding invitation cards. Never try to make such a giant heart. It is unexpectedly lovely! So pleased that I was given this chance to make this lovely stamp for Whitney's wedding! I have finished the custom order for Shonda's wedding. They are 6 little bunches of billy ball flowers in the shades of purple and blue. I love to work for others' wedding so much. Not only I would be honored to be involved in others' lovely wedding, but also I could feel the LOVE. Nothing more wonderful than to spread love and I really hope my love in making all these flowers do come to Shonda. Come and have a look! ;) They are lovely! 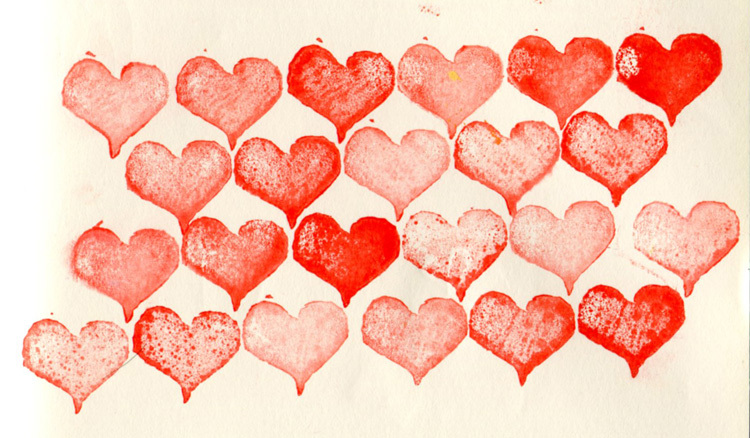 the SoftTear, hand needle felt accessories, and the Keris, hand carved rubber stamps wish you a sweet Valentine's Day! 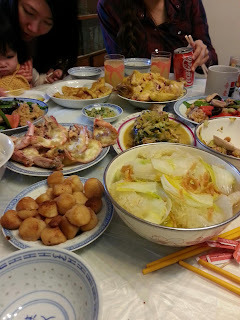 It has come to Chor 2 of the Chinese New Year. As my family's usual practice, we went to Tai O of Hong Kong, which is called the Venice of Hong Kong. It is a very famous attraction spot in Hong Kong which I strongly recommend to people who are visiting Hong Kong. It is very beautiful! The reason why I had to go to Tai O on Chor 2 was that all my family memebers are rooted in Tai O and every year on Chor 2, we would gather together. Greeting one another and have family lunch together. 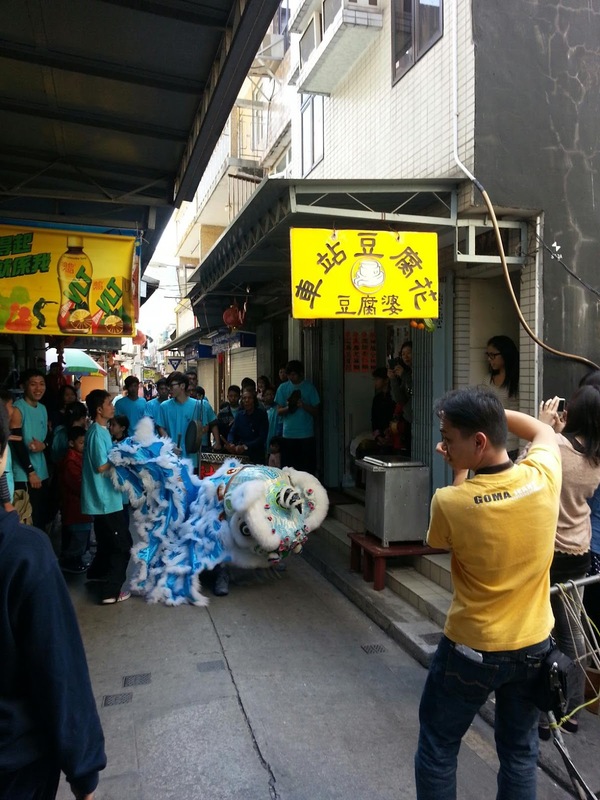 There would be Lion Dance on the street in Tai O every year! My relatives have given me lots of laisee! Lucky me! It has come to Chor 1 (the first day of the Year of the Snake). My mum and dad and I had done all the decoration for the New Year. We stuck Fai Chun onto the Wall of our home. They are some hand written ones with lovely blessings for Good Health, Good Fortune and the Sufficiency of Food. We put chocolates, candies and seeds (瓜子) into the red box (全盒). This box is for serving relatives who are visiting. We would serve it with Chinese tea. My mum and dad gave me their red pockets (also Lai See) wishing me all the best for the coming year! The red pockets look very lovely! I usually keep it un-opened till the end of the year. And, we had family gathering with my brothers and their family members. I always think Chinese New Year is the most lovely moment throughout the Year. It is full of laughters and blessings. People will greet others by saying Kung Hei Fa Choi and wishing them good luck. Family members will gather together for dinners. I love Chinese New Year much! It has come to a very important Holiday in Hong Kong for all Chinese to celebrate, the Lunar New Year (also the Chinese New Year). It is one of the holiday in Hong Kong. Chrysanthemum is another choice for New Year. Chrysanthemum symbolises perfection, optimism and joy which are important in the Chinese family. Another one is 五代同堂 (very sorry I do not know the English name for it). It symbolises all family members of different generation gather together. For me, I have bought some Peach Blossom flowers for the hope of better relationships and lucks. I especially love the Lunar New Year! Full of joy, peace and warmth. Easter holiday is coming! I have put some new wool felt products onto my shop @ Etsy! They are felted chickens and Easter eggs! Very bright color that make them very cheerful and joyful. They can be used to decorate your home during the Easter holiday! 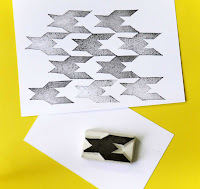 There are a number of ways to use a rubber stamp. One of those I tried today is to decorate your gift bag! 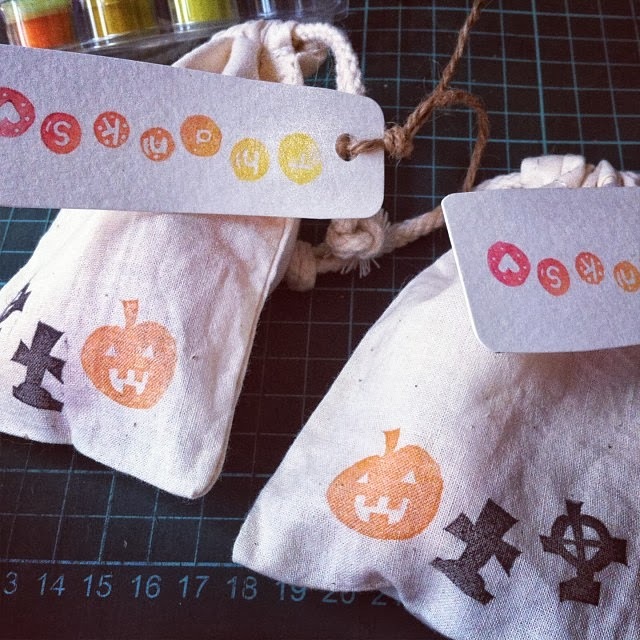 By using stamp pads with different colors and different stamps, you can create your own gift bags for your friends as cute and pretty as it can be! Try it! & have Fun! I have been busy writing Christmas cards for my friends. I have carved some stamps for Christmas card writing use. These stamps are for personal use only, not available @Etsy. It is because the stamps are not able to ship before Christmas for orders. Maybe, available next Christmas! There are some new stamps @Etsy!! There are some special stamp sets! Do come and have a look at!! 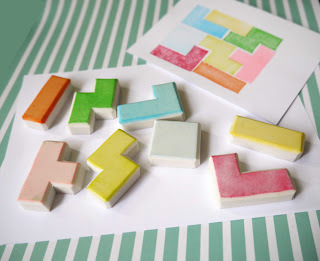 Stamp set of Tetris Shapes! 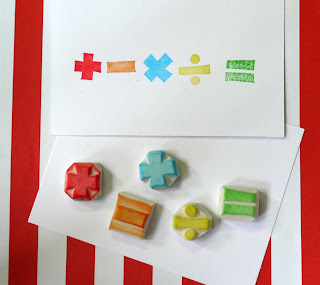 Stamp set of mathematics symbol! I have been sick for 2 weeks and that, my blog has been abandoned for weeks too. I have worked on a custom order for Jess. It is a set of 12 mustache rubber stamps. The stamp are used for cards for Jess' wedding and each table is with a different mustache. I am very delighted and excited to work as part of her wedding. The stamps are large ones and very special, and with love.